The Seafood Paradise Game Board is a 6-8 player PCB featuring the ocean-themed fish hunter game that is hugely popular among players! This PCB is used to replace boards in current Seafood Paradise machines or can be used to update any number of 6-8 player fish hunter arcade cabinets, as the board can be set for either 6 or 8 players. This allows operators more variety from a single board. These game boards are upgradable to add bill acceptors and thermal printers and there is not need to grab any extra equipment. With this English version board it can be directly connected from PCB to IO board to the acceptor or printer - very easy and simple, and much less mess inside your machine! The game itself comes with a number of fun features to keep player entertained and coming back for more chances to win! 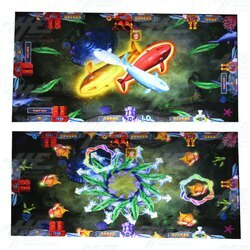 This PCB is used to replace boards in current Seafood Paradise machines or can be used to update any number of 6-8 player fish hunter arcade cabinets, as the board can be set for either 6 or 8 players. This allows operators more variety from a single board. These game boards are upgradable to add bill acceptors and thermal printers and there is not need to grab any extra equipment. With this English version board it can be directly connected from PCB to IO board to the acceptor or printer - very easy and simple, and much less mess inside your machine! The game itself comes with a number of fun features to keep player entertained and coming back for more chances to win! 19 different kinds of fish to catch - the bigger the fish, the more points you earn! Special character weapon - the Spongebob Bomb! This awesome character feature cane give playes a x2~x10 bonus with a maximum of 1000x reward! Timer Bomb: Shoot the Timer Bomb and cause undersea storm! The storm will attack all fish in the field. Fish killed by the storm belong to the player who launches the Timer Bomb. Fish King: Fish surrounded by dolphin ring become Fish King. Killing the Fish King causes all same kind of fish in the field die and gets the scores.